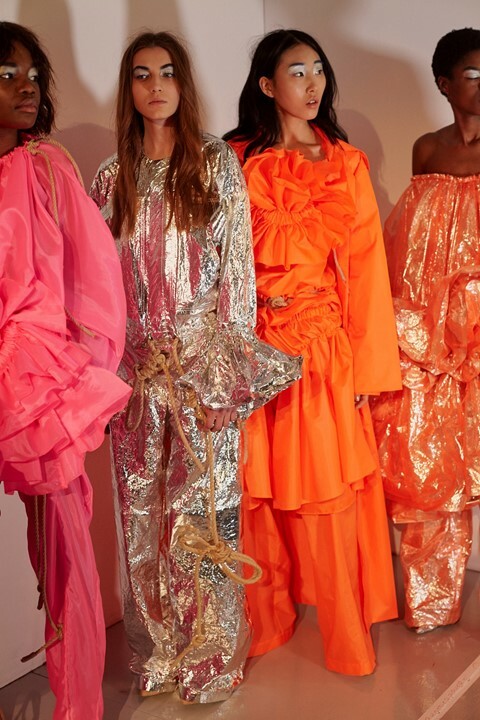 Last night, the Central Saint Martins MA class of 2017 showed their graduate collections and, as usual, they announced the winners of the Creative Award presented with L’Oréal. This time, there were joint winners: Gabriele Skucas and Stefan Cooke. Both got attention with the BA graduate shows back in 2015 (and we covered Cooke in this piece here). Having formerly worked for the likes of Galliano and Walter van Beirendonck, Cooke’s talent manifested last night as tartan pieces twisted and tight against the body, as well as cowboy boots – but not quite like you’re imagining, appearing as a cutout illusion on the boot itself. Gabriele Skucas, meanwhile had a more traditional approach. The womenswear knit graduate showed a collection which included skirts that took over thirty days to crochet by hand. Talk about dedication. But then the CSM lot have always been a dedicated bunch, and it’s this talent and hard work that continually makes the show so exciting. With alums like Charles Jeffrey on the front row, you were reminded of how successful this trajectory can be, and how London will always be the place to look for fresh creative perspectives.